Despite not being able to sell the iPhone, a reportedly leaked employee memo reveals that T-Mobile will begin to offer official support for subscribers using unlocked versions of Apple's popular handset on its network. The memo, which was published on T-Mobile blog TmoNews.com, notifies current T-Mobile employees that starting Jan. 30, it will be initiating a support program for the carrier's estimated one million customers who use an unlocked iPhone on the network. 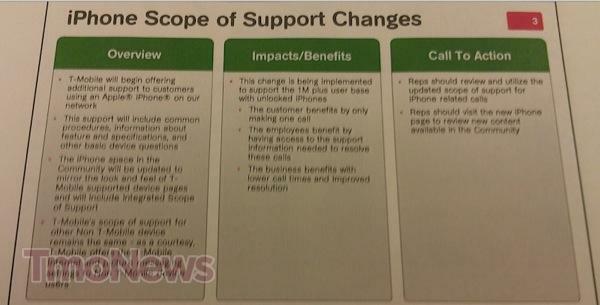 Coverage under the new "iPhone Scope of Support" is not comprehensive, but does include help with common procedures, information regarding handset features and specifications and "other basic device questions." Currently, iPhone information on T-Mobile's support page is sparse and mainly focused on getting unlocked handset users up and running on the carrier's network. For example, when running a search for "iPhone" on the company's website, the top hit is a page detailing internet and picture messaging settings for the Apple smartphone. While T-Mobile is not an official Apple carrier partner and operates on a wireless spectrum not supported by the iPhone, a report in December noted that the Deutsche Telekom holding company had been "refarming" its AWS 3G spectrum in a move that granted compatibility for unlocked versions of the device. As contract-free iPhones are unsubsidized, they cost significantly more than their AT&T, Sprint or Verizon counterparts, however it could be the only option for a customer who is loyal to their current carrier. An on-contract 16 GB iPhone 4S is priced at $199, while the unlocked version costs $649. Earlier this month, T-Mobile CEO Philipp Humm said that the company's wireless operating frequency was the key reason as to why it doesn't yet sell the iPhone. Most recently, U.S. number two mobile carrier AT&T filed for FCC approval to transfer wireless spectrum worth $1 billion to T-Mobile, a result of a failed $39 billion bid to takeover of the smaller company. AT&T must also pay the German-owned carrier $3 billion in cash to fulfill the deal's pre-negotiated terms. Apple's smartphone is seen as a major boon for networks that support it, and carriers have even blamed poor customer sign-up rates on not having access to the device. When the iPhone 4S was launched in October 2011, it was reported that Sprint had struck a $20 billion deal with Apple for rights to sell the next-generation handset.